formation for a more efficient and sustainable regional landscape planning. ral vegetation have been carried out in this region. 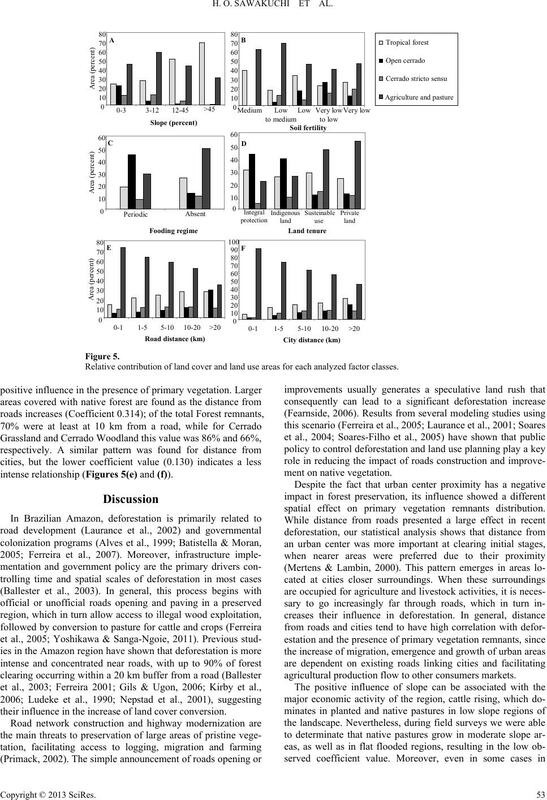 digenous lands (Alencar et al., 2004). factors are responsible for preventing native vegetation losses. H. O. SAWAKUCHI ET AL. native vegetation structure and configuration of the landscape. 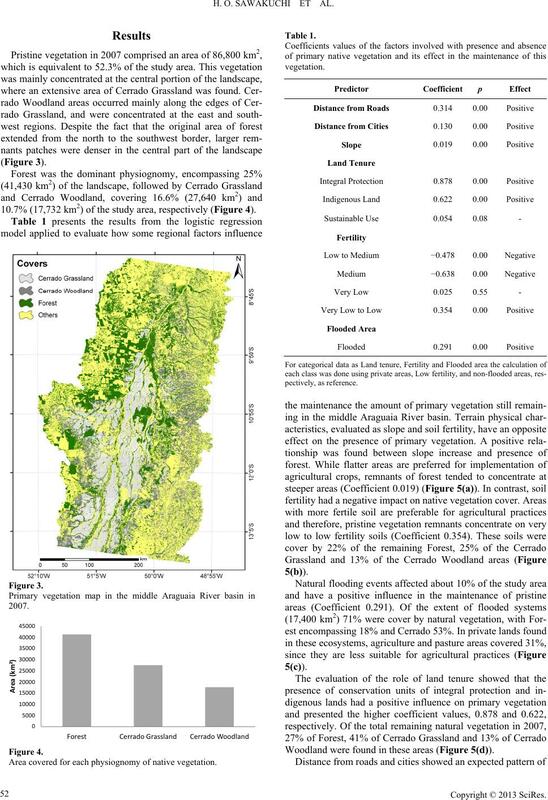 by Cerrado Woodland and Alluvial Forest (Diegues, 2002). the biomes that the area encompasses. overall accuracy of 85.02% and overall Kappa statistics of 0.75.
nomies and 3) Cerrado Woodland for shrubs dominated areas. tenure; 5) fertility; and 6) presence of flooding areas (Figure 2). resolution of all grid cell maps in 80 meters. federal roads, totalizing 3350 km, of which 1884 km are paved. (b) Distance to cities; (c) Slope; (d) Land tenure; (e) Fertility; and (f) Presence of flooding areas. centrated in northwest and northeast regions. flooded area was used as reference for the calculation. in Minitab software, with p-value coefficients lower than 0.05.
showing the presence or absence of native vegetation. of Land Tenure classes, private areas were used as reference. ability map of Brazil (IBAMA dataset, http://siscom.ibama.gov. allowing the visualization of higher and lower classes. formation from all maps and build a matrix. 10.7% (17,732 km2) of the study area, respectively (Figure 4). Area covered for each physiognomy of native vegetation. Woodland were found in these areas (Figure 5(d)). Relative contribution of land cover and land use areas for each analyzed factor classes. intense relationship (Figures 5(e) and (f)). their influence in the increase of land cover conversion. 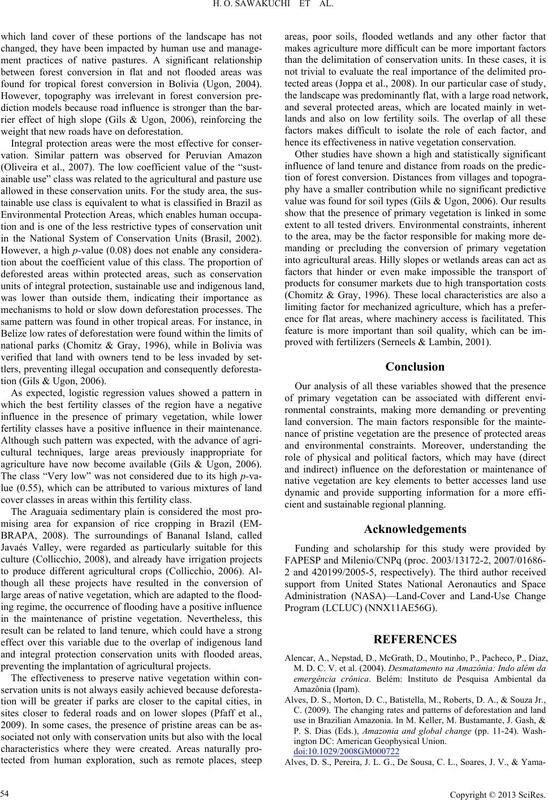 spatial effect on primary vegetation remnants distribution. agricultural production flow to other consumers markets. found for tropical forest conversion in Bolivia (Ugon, 2004). weight that new roads have on deforestation. in the National System of Conservation Units (Brasil, 2002). tion (Gils & Ugon, 2006). fertility classes have a positive influence in their maintenance. agriculture have now become available (Gils & Ugon, 2006). cover classes in areas within this fertility class. preventing the implantation of agricultural projects. hence its effectiveness in native vegetation conservation. proved with fertilizers (Serneels & Lambin, 2001). cient and sustainable regional planning. ington DC: American Geophysical Union. Asner, G. P., Keller, M., Lentini, M., Merry, F., & Souza Jr., C. (2009). Selective logging and its relation to deforestation. In M. Keller, M.
change (pp. 25-42). Washington DC: American Geophysical Union. search, 114, Article ID: G01003. Bruner, A. G., Gullison, R. E., Rice, R. E., & da Fonseca, G. A. B. (2001). Effectiveness of parks in protecting tropical biodiversity. do Tocantins. 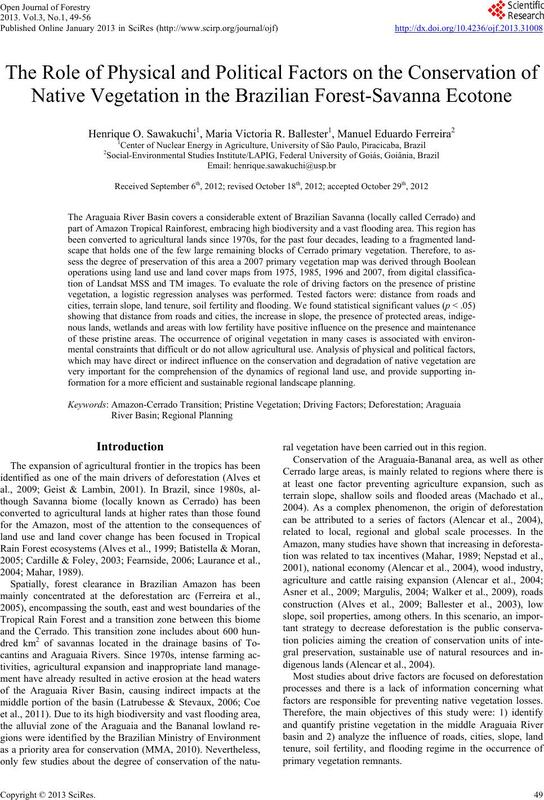 Ph.D. Thesis, Piracicaba: University of São Paulo. local. Ph.D. Thesis, São Paulo: University Of São Paulo. manas e áreas úmidas, USP. Goiás: EMBRAPA Arroz e Feijão. pactos e controle. Acta A mazonica, 36, 395-400.
remote sensing and census data. Earth I nterac tion s, 11, 1-16. Geist, H. J., & Lambin, E. F. (2001). What drives tropical deforestation? of the United States of America, 105, 6673-6678.
zilian Amazon. Futures, 38, 432-453. Latrubesse, E. M., Amsler, M. L., de Morais, R. P., & Aquino, S. (2009). the Araguaia River. Geomorphology, 113, 239-252.
guaia, Brasil central. Revista U nG—G eoci ênci as, 5, 65-73. Laurance, W. F., Albernaz, A. K. M., Fearnside, P. M., Vasconcelos, H.
tion in the Brazilian Amazon. 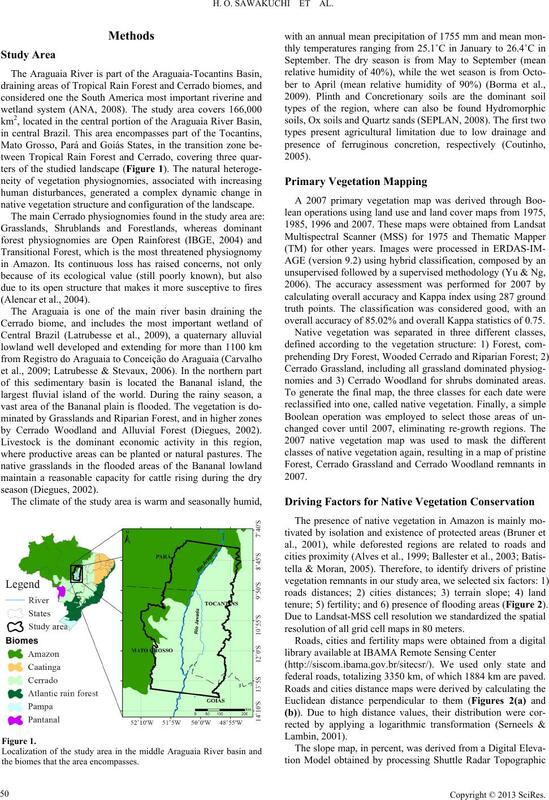 Journal of Biogeography, 29, 737-748.
of Environmental Management, 31, 247-259.
área do Cerrado brasileiro. Conservação Internacional. Amazon region. Washington: World Bank Publications. Margulis, S. (2004). Causas do desmatamento da Amazonia Brasileira. the Peruvian Amazon. Science, 317, 1233-1236.
characteristics cause differences in park impacts across Costa Rica. B.E. Journal of Economic Analysis & Policy, 9, 26.
culture, Ecosystems & Environment, 85, 65-81. Santarem-Cuiaba corridor. Global Change Bi olo gy, 10, 745-764.
para a Amazônia. 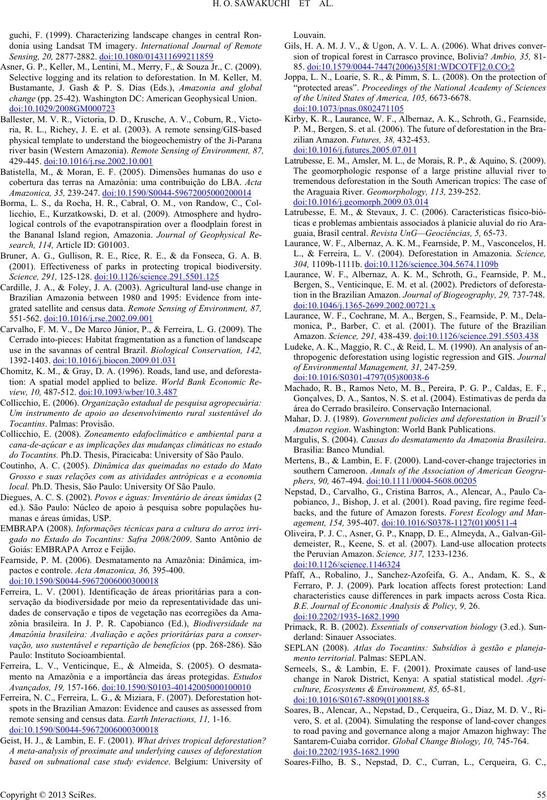 Estudos Avançados, 19, 137-152.
conversion: A case study os Carrasco province (1986-2002), Bolivia. Science and Earth Observation (ITC). in Brazilian Amazonia. In M. Keller, M. Bustamante, J. Gash, & P. S.
Guangzhou. 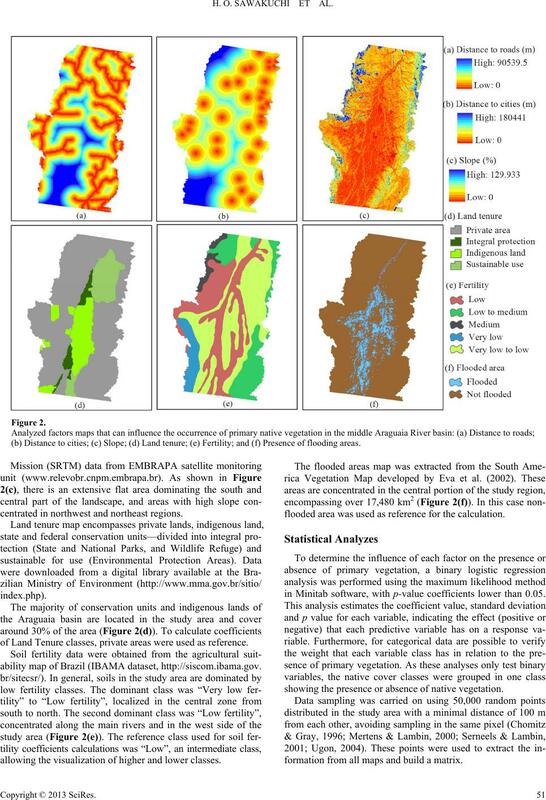 International Journal of Remote Sensing, 27, 1075-1092.